I had a great time checking out the Rhythm! Discovery Center. There are tons of rare and interesting instruments to check out. I learned a lot and had a lot of fun. I’d advise everybody to check it out no matter what you’re into…rhythm is in everyone, not just drummers and percussionists! The Rhythm! 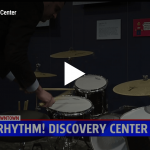 Discovery Center is a one-of-a-kind gold mine for percussionists – or any rhythm enthusiasts – of all ages. I found it to be a wealth of extremely important historical material – and personally, an invaluable experience that has proven to be greatly inspirational. It’s also completely accessible for non-drummers to have a hands on experience with all things percussion and learn about the evolution and development of percussion the world over. Sam: “I love that place. You get to make awesome music!” Dad: “What a hidden gem Rhythm is! This is an educational museum done right. Not only are you learning the history through various media tools, you are also able to play a wide variety of real instruments that are spread around the exhibits. You might lose yourself in the center of the city, but you might never want to be found. When you do return to the traffic and the normalcy, you’ll certainly be more in touch with the beat, the rhythm of life. For a louder experience, try a hidden gem downtown…. Get ready for some volume–the center has more than 150 instruments for children and adults to play as well as interactive learning exhibits. Each time we go, we’re captured by a new set of instruments we didn’t play the time before. A wonderful place to visit with your family–especially those who have kids that find self expression in noise! I absolutely LOVED your center! I told my family that when we return to Indy, I want to show them your place. Everyone was having so much fun, you’ve got some amazing and interesting things to see and do there. I look forward to our next visit! In downtown Indy is this magical place where you can bang on a variety of percussion instruments. I was able to visit the Rhythm! Discovery Center last Thursday, I was in town for the DCI semifinals, and had some time to kill between lunch and the show… I also wanted to go see Neil Peart’s old drum kit, I follow it’s “movement” on Tom’s Facebook page dedicated to it. My wife was with me, so I wasn’t sure how long I’d be there…so I hit a lot of the exhibits a little quicker than I’d hoped (I could spend the whole day there, but I didn’t want to overstay her visit) I did get to see everything I wanted to see, and enjoyed the sound booth’s that had items in them. (and enjoyed watching a kid who when I spoke with his father, found out he was in junior high, and noticed that he had a decent set of chops for a kid that age!) I also caught my wife playing things, and she had a grin on her face as she did…so I really think SHE enjoyed herself not being a percussionist. (she’s a baritone player). I’m hoping to come back out again, and possibly attempt your “Behind the Glass” tour, that looks like it could be fun as well! Thank you for what you are doing! Drummers and percussionists are an oft maligned breed! Super cool place. A safe haven to play as you like. Awesome sets. And you gotta see Neil Peart's R40.